Happy New Year; Happy Birthday! The Linking Ring, November, 1936 - I.B.M. The Linking Ring, Vol. XV!, No. 11, January, 1937 - I.B.M. Paging Mr. Edward Reese - letter from John Snyder, Jr. The Linking Ring, Vol. 16, No. 12, February, 1937 - I.B.M. The Linking Ring, Vol. VII, No. 1, Match, 1937 - I.B.M. The Covered Deck Switch - Oscar Weigle, Jr.
Fratres Sincipitis Mystici - new organization in Harrisburg, Pa.
News Notes - "error" in last month's "Tops"
The Linking Ring, Vol. XVII, No. 2, April, 1937 - I.B.M. I Thought You'd Like to Know Dept. Ever-Ready Switch - K. L. Grunwald "Leon"
R. R. Miller of Clarksburg, W. Va. The Easy Vanish - Robert O. Ellis, Jr.
Thomas Frost and His "Lives"
The Fan from the Far East - Harvey M. Powers, Jr.
Pocket Hide-Out - A. Midey, Jr. The Linking Ring, July, 1937, Vol. XVII, No. 5 - I.B.M. 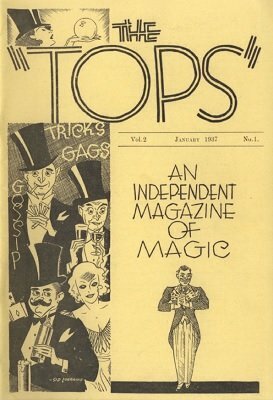 Watch For Next Month's "Tops"